AzhwAr meditated upon these aspects, determined that unless one gives up worldly attachements, one cannot enjoy such sarvESvaran. He reveals his detachment towards everything else to those who care for him and who stop him from engaging with emperumAn to pacify him. This is explained by AzhwAr as follows: a divine consort (parAnguSa nAyaki [AzhwAr in feminine mood]) of nAyaka (emperumAn) gets separated from him; due to her desire to unite with emperumAn, she becomes totally detached from her friends, mothers, the birds such as parrot, mynah, peacock, cuckoo and everyone; giving up from sthrIthva (femininity) etc, having her heart captivated by his beautiful form, mercifully explains these in this decad. The focus of previous decad is prApakam (means); the focus of this decad is prApyam (goal). 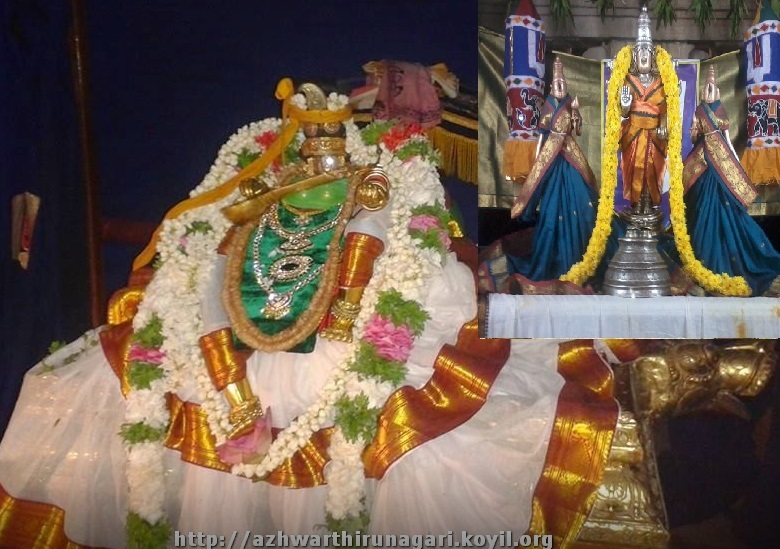 In the previous decad, AzhwAr unnecessarily doubted emperumAn‘s qualities and intrinsic nature and acquired clarity, eliminated the question of having any qualification for self effort by saying in thiruvAimozhi 8.1.8 “vaNangum ARu aRiyEn” (I don’t know how to worship you), highlighted nyasthabharathai (total dependence) on him by saying in thiruvAimozhi 8.1.9 “yAnum nIdhAnE AvadhO meyyE” (I am you due to being your attribute, this is truth) and incidentally established that emperumAn is the means. As emperumAn is the means, there is no reason for the delay in attaining the goal, AzhwAr wondered “what could be the reason for his non arrival? There is nothing to be seen in him in that aspect, it should be something in us only”. sIthAp pirAtti too said as in SrI rAmAyaNam sundhara kANdam 38.48 “mamaiva dhushkrutham kinchin mahadhasthi na samSaya:” (No doubt, my sins are huge). AzhwAr too thinks “Since time immemorial, we have been in this samsAram and enjoyed whatever we saw; since emperumAn is sarvagya (omniscient), it is not that he does not know our previous state and current desire; while we don’t know, there should be some defect in us, where he is not convinced of our attachment towards him” and further thinks “whether we have the attachment towards him or not, let us make it clear to his divine heart that we have no attachment towards anything other than him”, and mercifully explains his distaste for prApya virOdhi [hurdles in the goal, i.e. worldly pleasures] and prApaka virOdhi (hurdles in means, i.e. other upAyams such as karma yOga etc), through someone else’s words. A pirAtti (consort, parAnguSa nAyaki) who united with sarvESvaran and separated, as she observes his non arrival, set out to go to his abode to meet him; her friends and others observed that and gave good advice saying “this is not good for you” and tried to retract her; speaking to them, as if revealing her detachment for her friends and others, she impresses the same in his divine heart. This entry was posted in thiruvAimozhi, thiruvAimozhi 8th centum on February 8, 2019 by Sarathy Thothathri.